Tansy is a perennial with aromatic fern-like folliage smelling similar to camphor and rosemary. Said to repel ants, flies, beetles, squash bugs and aphids. Also used as a compost activator. Flowers can be used in dried flower arrangements. Approximately 800 seeds per packet. Tansy is native to temperate regions of Europe and Asia. The scented foliage of tansy helps to repel harmful insects from the garden while the yellow flowers may help to attract beneficial insects such as ladybugs to the garden. Tansy is sometimes used as a companion plant for cucumbers, squash and other cucurbits as it helps to repel many of their pests such as cucumber beetles and squash bugs. The dried flowers retain their yellow colour in floral arrangements and can even be used to make a yellow dye. Tansy leaves contains high levels of potassium which when added to compost piles can help speed up decomposition if this nutrient is at low levels. Dried tansy is used by some bee-keepers as fuel in bee smokers to subdue bees during hive maintenance. Plant tansy in a location that receives full sun or light shade, in warmer climates a lightly shaded location is preferred as plants may become heat stressed in full sun. Tansy bushes that have become too scraggly can be cut back hard in early Spring when new growth has started to sprout. Tansy is a perennial and will keep growing back for many years. Tansy may self-sow and spread aggressively through the garden in optimal conditions, deadhead spent flowers regularly if this becomes a problem. In cold and mountainous regions of Australia sow tansy seeds from early Spring to early Summer. In temperate regions of Australia sow tansy seeds from late Winter to mid Summer. 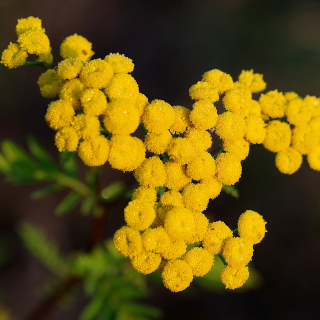 In subtropical and tropical areas of Australia sow tansy seeds from early Autumn to early Winter. Surface sow Tansy seeds and cover lightly by sprinkling growing medium over the seeds. Do not bury the seeds too deeply as they require some light to reach them in order to germinate. Press down gently to ensure good contact between the moist growing medium and the seeds, this helps to prevent them drying out between waterings. Space plants about 20cm apart to allow them room to grow. Tansy seeds can be slow to germinate, taking between 20 and 30 days to emerge depending on soil temperatures. Expect your tansy plants to begin flowering from about a year after sowing.